Social media has enabled me to connect with more people, become more outgoing, and has facilitated me being able to better connect others with resources and support causes that are important to me. I know you will be shocked but I have never been much of a career girl. I've had lots of jobs, good and bad, but nothing I really loved and excelled at aside from doing promotions for my college radio station. In retrospect, I kind of wish I'd payed more attention in advertising class instead of booking bands and making flyers all the time. At the time, I didn't really think that was viable work but it sure beat selling records at Tower. (I will admit that selling records at Waterloo was actually pretty awesome most of the time I worked there.) I always had a sense of unease with anything remotely corporate and kept to the odd jobs I felt meshed best with my self-imposed underdog status. Suffice it to say, being gainfully employed has never been my forte but, luckily, I've always had a knack for social interaction. Why am I telling you this? Since I started blogging, I've developed an unhealthy interest in the world of social media. I like the unpredictable juncture of emerging technology and bare-bones person-to-person contact. Having been off the job market for some time now, I've been perusing business books and trying to figure out where I should start looking once Jasper is in school full time. Basically, I want to know how to put everything I already know to work NOW, which is almost entirely different than the work world I was in a decade ago, pre-kids and settling down. 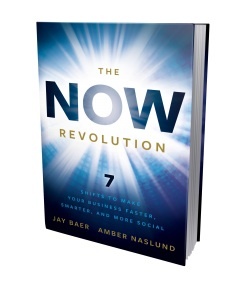 I was pleased to be able to review Jay Baer and Amber Naslund's new book The Now Revolution because it doesn't waste a lot of time trying to convince you that the social web is here to stay. It pretty much assumes you already know that. What it does do is tell you how you can implement some simple changes to help you become more adaptive and keep up with the world around you. Baer and Naslund break it down into “7 Shifts To Make Businesses Faster, Smarter & More Social” that are immediately actionable. The case studies cited are engaging and applicable and the whole thing reads like you're talking to a peer, not being preached at, which was refreshing. (In fact, the only time they lost me was when they started using football analogies. The business stuff I could wrap my head around but I know nothing about televised sports…) Oddly enough, there are a zillion parallels between using social media for business and parenting. Listening, empowering, respect, forward-thinking… good for your kiddos and good for your corporate culture. Join The Now Revolution on Facebook and on Twitter. To enter and win a copy of The Now Revolution, please comment on this post and let me know how you've changed because of social media. Entries will be accepted through March 30th and I'll pick the winner using Random.org. US readers are eligible. For additional entries: - Post my button on your blog (see code on sidebar) - Follow my blog - Follow @superdumb on Twitter - Like Superdumb Supervillain on Facebook - Fave me on Technorati - Subscribe via email - Subscribe via reader Leave an extra comment letting me know what you did for each additional entry. In accordance to the FTC Guidelines and WOMMA Code of Ethics, I am disclosing that I received a copy of the book to facilitate this review but all opinions are strictly my own. I have been teaching middle school science and social media has totally changed the "way we do business in schools". Despite what many think, Facebook is not simply a method of connecting with friends of the past and present. Nor does it have to be a way for pedophiles and psychopaths to gain a glimpse of young students posing as adults. With proper education and safeguards, facebook and other social media can be an invaluable teaching tool uniting teachers, parents and students, allowing families to take an active role in their child's education and encouraging children to learn "beyond the classroom". Chatting with a civil war expert or geneticist, watching a real time science experiment or arranging a virtual field trip to a museum can allow students to gain real world access beyond the often sheltered lives that many are forced to lead. Social media has greatly impacted education and through consistent education it is our responsibility to teach students how to use it appropriately and safely to enable them to access knowledge and experiences they may have never otherwise experienced. Social Media has changed me in so many positive ways. I've found a bunch of fantastic people who get me. That is great. It has changed me in great ways. Just this week thanks to social media I was able to help a charity in my community that most likely it would have not happened otherwise. I feel like I'm more aware of the world around me since I get constant updates about personal issues and global issues.